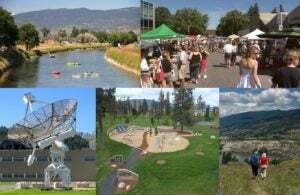 Free Things to do in Penticton - All the fun, no cost! Are you entertaining guests or family on a budget and struggling for ideas? Fear not, there are plenty of free things to do here in Penticton. From walking or biking the Kettle Valley Railway to Floating the Channel, there are plenty of activities to do while in Penticton! Walk the Penticton Farmer’s Market. Every Saturday on Main Street, from April 23 to October 29 – 8:30am – 1:00pm. Throw down a picnic blanket and listen to some live music or take in a show at one of the summers’ many free concerts or festivals. Have some play time at the Discover Park beside Skaha Lake. The natural playground encourages children to move and use their imagination. Float the Channel. Slap on the sunscreen, pack up the cool box and spend a few hours leisurely drifting the cool waters of the Penticton Channel. If you would like more information drop by our Visitor Centre located at 888 Westminster Ave W. Our friendly staff will be happy to offer expert advise on other great fun, free things to do in Penticton.